Tent and Table is your premium distributor of heavy duty pole tents and canopy tents for sale. Our high quality, commercial pole tents are durable, high quality materials and are built to last. We offer a large selection of canopy and pole tents for all occasions. Our commercial grade canopy and pole tents are an excellent addition to any party tent rental or event business. Our pole tents are the perfect party tent for your large outdoor event, including backyard parties, wedding receptions, graduations, church events, reunions and more. Pole tents are the perfect large outdoor party tent for your next event! 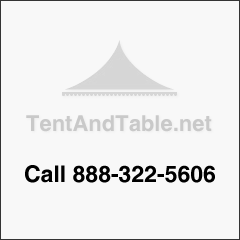 The classes pole tent look originates from the center tent pole, which supports the vinyl tent top and cover, which is then stretched across to the side tent poles. These high-quality commercial vinyl pole tents are built to last and designed to withstand the wear and tear of being set up and taken down multiple times each year.